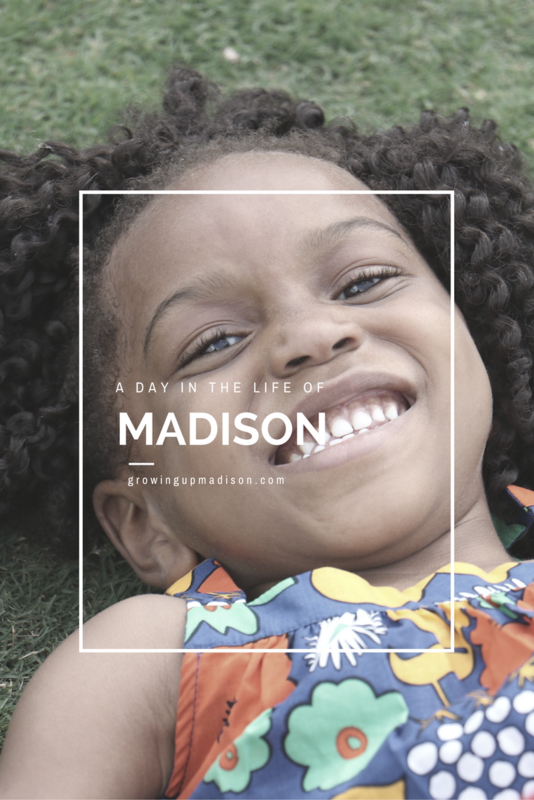 Hi, this is Madison and I have to admit that it's been ages since I've actually done any work at all here on Growing Up Madison. When the new year started, mommy decided that she was going to make some major changes, and one of those changes was that I was going to take a break. She would do most of the work here on the blog and I would do what I did best. I would model and be the kid that I was meant to be. This year has been amazing and so far I've been able to visit a few countries, including the UK and France and I've also been to two different Disney parks in two countries. Yay me! However, I bet you've been wondering what I've been up to. Well, I'm here to share a few things and give you a glimpse into my life on a daily basis. However in order for me to keep up with all that I do, mommy makes sure that I take my Nature Made® KIDS FIRST® Gummies, which she picks up at Target. So how does a typical day begin? Well I have to tell you that no two days is ever alike. We're on a constant go, go, GO! However, the one thing that does remain constant is that I get up around 6:30am every morning. If I'm not in mommy's bed, which is usually most of the time, I then wake her up because after all, if I'm up then everyone has to be up. Getting up early also means that I'm going to need breakfast, but first I have to brush my teeth. Mommy hates morning breath and she insists that I brush. Breakfast usually consists of waffles or pancakes, eggs, sausages and a nice big glass of milk, and of course there's always fruit in the refrigerator or in the fruit bowl. Mommy insists that I eat a good breakfast because she claims it's the most important meal of the day. 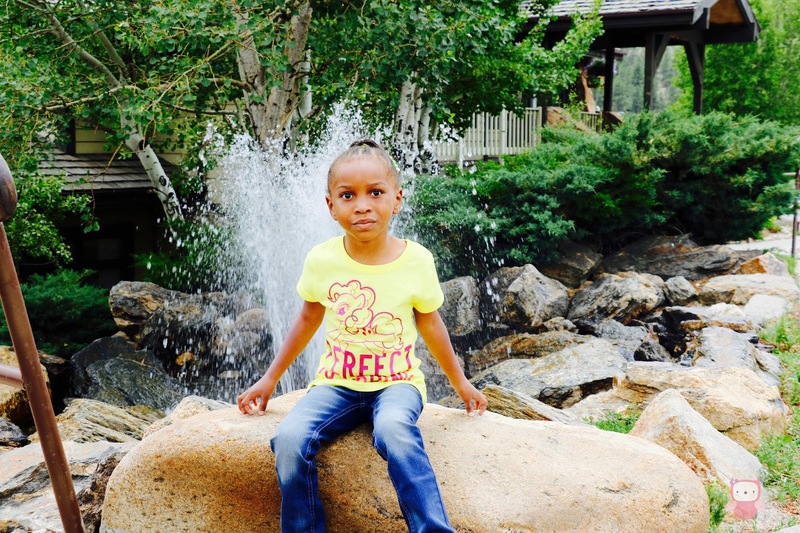 Once breakfast is over, the fun begins, but first mommy insists that I take my Nature Made® KIDS FIRST® products. My regimen consists of the KIDS FIRST® Multivitamin with Omega-3 Gummies, KIDS FIRST® Calcium + Vitamin D3 Gummies and the KIDS FIRST® Fiber Gummies. 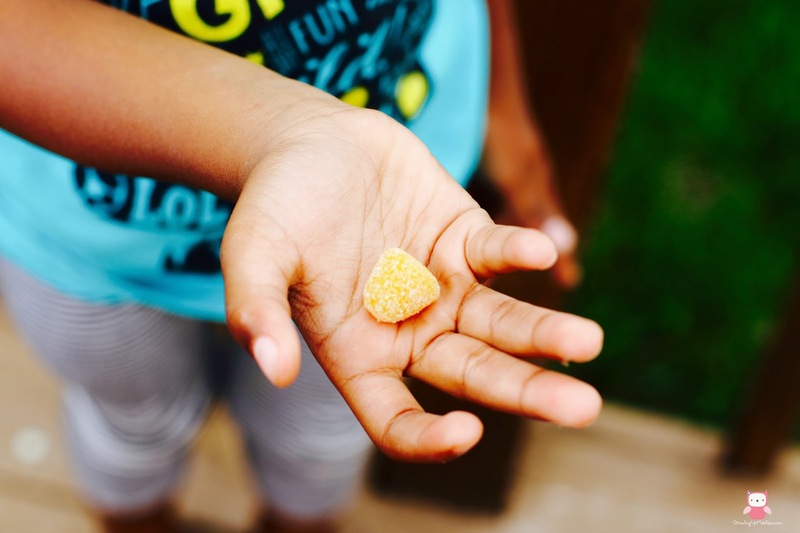 Each does something different for me, but what mommy likes about them is that they are Gluten Free, made with all-natural fruit flavors, their colors are derived from natural sources, there are no synthetic dyes and contains no preservatives or yeast. Our adventures usually take us through an entire day and so that usually means that I eat whatever is available at the closest restaurant since mommy rarely packs a meal. While she may have a few snacks, there's never really anything substantial to eat and I'm not going to starve because mommy wants to have fun. OK, granted, I also want to have fun, but I also want to eat as well. I'm a growing child and I need my calcium for my growing bones, after all I need to be able to run and jump around all day long. 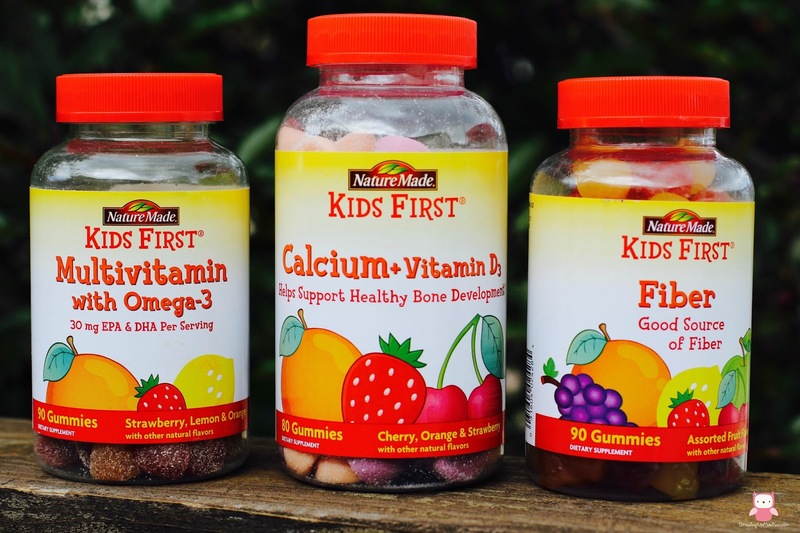 With school back in session, my Nature Made® KIDS FIRST® Gummies products are a staple in my regimen and will continue to be. Mommy loves them and so do I. Not only do they taste great, but they're good for me too. I just have to remember they're not candy, so mommy keeps them out of my reach. Be sure you pick up your supply at your local Target like I do and have your kids back-to-school ready. These tummies sound great. I've tried everything with my kid, he hates the basic kid vitamin tablets even tho they are fruit flavored. Might try these. Good thing he eats his veggies. I aways start my day with Nature Made vitamins. I love that they don't use synthetic dyes or contain preservatives. That's definitely important in a good vitamin (not to mention they taste really yummy!). Oh I love Nature Made myself. I use the vitamelts for me. These sound like great gummies. I have never heard of them before but I would definitely like to try these with my own daughters! You should, they taste great! Even my oldest daughter eats them and she's an adult. They do have gummies for adults as well. 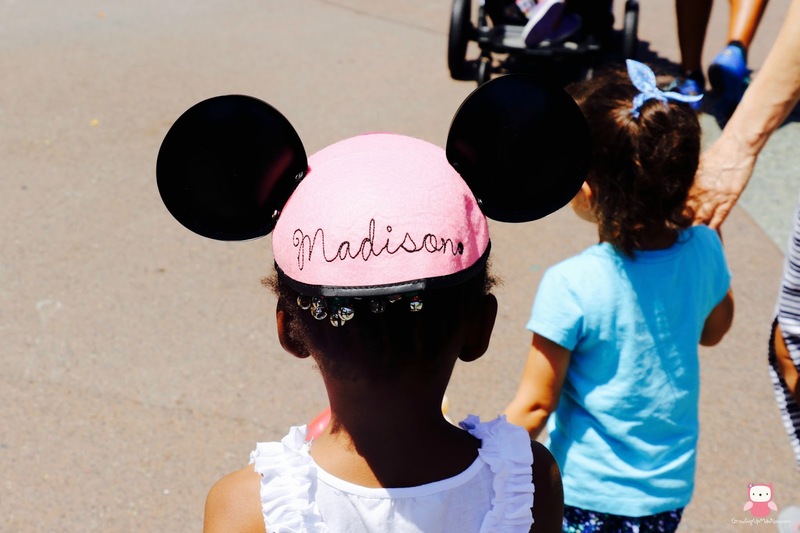 Great post, Madison! My grandkids take these vitamins too. They never complain because they love the taste and they usually remind their mom every morning after breakfast that it's time for their vitamins. I think it's the taste and that's why they remind them. They taste amazing! Right?! Seriously how can you go wrong with something that not only taste good but is good for you. You got it! These ones definitely are healthy AND tasty. We just love them. I have failed on remembering the vitamins with my kids. Thanks for the reminder on how important this tiny daily task is. Off to buy my kids their gummies. 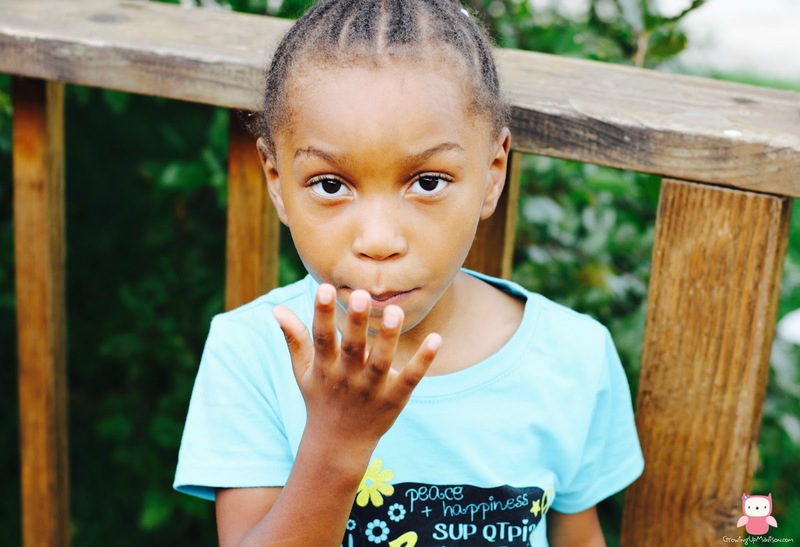 When you do buy your kids vitamin gummies, be sure that they're Nature Made KIDS FIRST Gummies. Never too young to be on vitamins. And I love Nature Made. I take their B-12 vitamins for an iron deficiency. Great, informative post! Thank you Jacqui, we love them too. I take their vitamelts products because I hate swallowing pills. 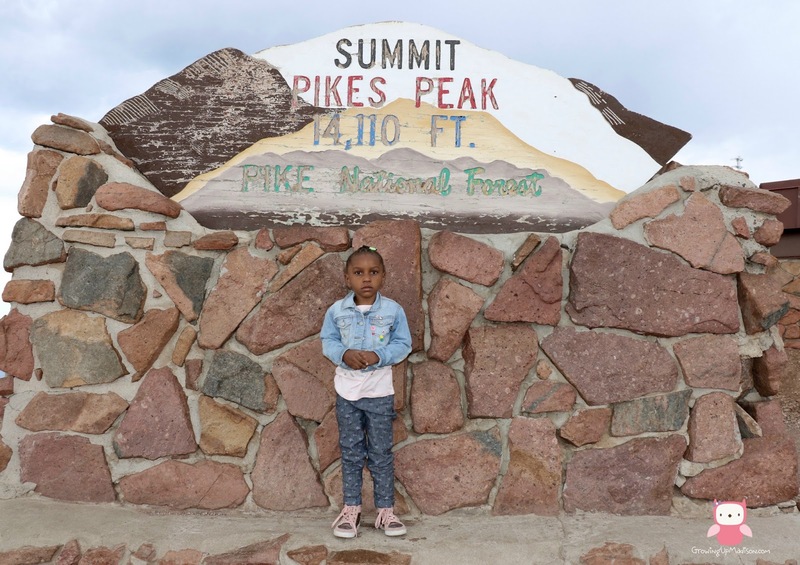 I have never been to pikes Peak that I've been wanting to go with my son. It is on our travel bucket list. We have never tried these gummy's before I will have to check into them. Oh be sure that when you go you either have your nausea medication on hand *just in case*, I got really sick at the top. I don't have kids but this sounds like a great way to get them in the habit of supplementing. It is an amazing way and the taste is so great that she doesn't mind taking them. I really like the Nature Made brand of vitamins. That is actually what I have in my medicine cabinet right now. I take them every morning. Oh it's what I have in mine too. We love the brand here at my house as well. I think it is great to start the day with some vitamins to get start your day ahead. Especially for kids too. It's an amazing way to start the day. At least you know that you have your daily does of vitamins and minerals just in case you skip a meal. This is super cute. It's good that those gummies are such a big part of the daily routine. They're really important! Yes they are essential to the start of a busy day. We use Nature Made vitamins too!! Seems like a lot of people do. We know a good thing when we see them. We use Nature Made Vitamins too! I like them because of the way they taste even though I'm a grownup. I hate swallowing pills. Oh I hate swallowing pills too so I use their adult gummies and their vitamelts. Those are great too! Nature Made Gummies seem very tasty and look very tempting to eat. They also happen to be very good for you packed full of vitamins and fibre as you've said. You seem full of energy and life so thumbs up for the Gummies. While I always had the energy for a full day, the gummies makes my day go by so much easier. I am a believer in vitamin gummies not just for kids but for adults too! I like that there is a fun way for kids to get the vitamins that they need in order to improve their health. Oh I love them for adults, they're great for those who hate swallowing pills like I am. Gummy vitamins are so awesome for kids, because it helps them actually want to take their vitamins. But I have to admit, I still take gummy vitamins as an adult haha! Oh you and me both! I just LOVE their gummies but have you tried their vitamelts? Those are great too! I need to get these for my kids! I'm always looking for vitamins that they'll actually like taking. Oh I think that your kids may actually love taking these. The adult gummies are great as well. I take them myself. Those look like a great option to ensure kids get their vitamins! Glad you shared these, I will have to share with some friends who have kids! Yes they are great and I just love them and so do my kids. First off, you're adorable! You should definitely write more about your adventures with your mom! It's really nice that you're taking vitamins that keep you strong and healthy everyday. I make sure my kids do too. Your mom's right (I mean, are moms ever wrong?) you should always start your day with a healthy breakfast and top it off with some vitamins, like your gummies! Madison, it's you again! How I've missed you. The vitamins look great. Des will try them. Also, I.. tend to eat my kids' vitamins. And proudly. Oh Tamara, I do the same thing with Madison's vitamins, don't they just taste amazing? I think Des would LOVE these. Vitamins have certainly come a long way since I was a kid! I'm glad that vitamins now include essentials like omega-3 fatty acids EPA and DHA. They really have along with a few other things. That's the thing, they taste so good that kids don't realize that they're NOT vitamins so they enjoy taking them. aww this is such a cute idea for a post, i love that it's in her perspective. Those dummies sound great, I love how natural they are! I have tried these gummies with my boys before. I think I need to get back into it! Yes I think you do. What made you stop taking them? My kids will definitely consume Nature Made gummies! Health and proper healthy diet is important for their development! Sometimes when you're on the go, especially when on vacation, you don't eat the way you're supposed to, so supplementing with these is a great idea. This is actually the only brand I will really buy and is in my medicine cabinet right now. Those gummies look really good! I remember back in the day when they had Flinstone vitamins and now they have gummies for those too! Those gummies seems to be really good and also easy way to add some vital vitamins for kids as they look like candies. That's the thing, they not only look but taste like candy too so kids just love taking them, not realizing that they're doing something good for their body. I used to buy those for my kids when they were little and they loved it. Believe me , it really helps them. Why have you stopped giving them their vitamins? You should most certainly continue. Vitamins are always great to have. I will have to pick some of these up for my kiddos. Yes they are and I agree you should pick some up. These vitamins sound great! I don't have children at the time, but I plan to start trying next year. Thank you for providing some useful knowledge when it comes to health. You're very welcome and I wish you the best. Nature Made currently have adult gummies as well if you're interested in trying them for yourself. Probably not, vitamins have gotten a lot tastier since we were young. This is a great way to give kids some essential nutrients and vitamins! It's an amazing way and I'm glad that they've made them taste better for kids. Those gummies seem to be a very nice idea! Vitamins are so important for all of us! Yes they are and these are the bomb!